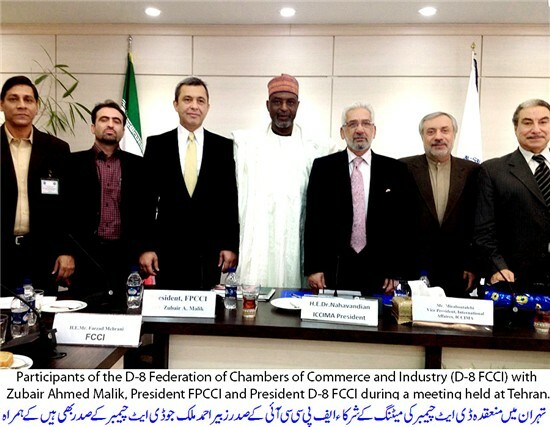 The President FPCCI and President D-8 Federation of Chambers of Commerce and Industry (D-8 FCCI), Zubair Ahmed Malik chaired the first committee meeting on finalization of D-8 FCCI Statute and 8th D-8 FCCI presidents meeting held in Tehran. The meeting was attended by the presidents of chambers of commerce of five member countries including Pakistan, Iran, Turkey, Egypt and Nigeria. The meeting discussed each and every Article of D-8 FCCI, prepared by FPCCI and proposed various inputs and suggestions to be incorporated in the Statute, which will be finalized in two weeks by Turkey in consultation with its legal experts. As President of the D-8 FCCI, Zubair Ahmed Malik emphasized that with a combined population of around one billion and a market size of more than $1 trillion, D-8 is set to emerge as one of the world’s most promising trade blocs. We are looking forward to achieve target of $500 billion for intra-bloc trade which has been set by our respective governments for 2018m he said. He pointed out that it is essential for D-8 FCCI to undertake goal-oriented activities for rendering the need assessed services to the private sector of its member countries in order to implement the vision presented in the D-8 roadmap 2008-18. He informed the member countries that FPCCI has drawn up a comprehensive action plan of activities for D-8 under which FPCCI will be sending delegations to the member countries for development of agriculture, industrial and manufacturing sectors. Moreover, he said, we will be forging business linkages, holding D-8 Business Forum and exhibition, organise seminar on SMEs for developing strategies to strengthen D-8 SMEs, launching of a website and creation of data bank, etc. The participants stressed that D-8 FCCI is a very powerful forum that can play a vital role in activating the business community and at the same time pushing governments for resolution of the current impediments to trade. They appreciated the efforts and measures taken by FPCCI to help achieve the true objectives of this forum.